Win more solo games using our essential collection of tips and tricks. Our Fortnite: Battle Royale Solo Tips, Tricks and Strategy article contains a number of pointers which’ll ensure you’re always the last man standing. Going it solo in Fortnite: BR is pretty stressful. It’s you versus the world and there’s no one to help you out when the going gets tough. This means it’s up to you - and only you - to make the correct decisions that'll lead you to building the right structures, getting geared up quickly and ultimately surviving fights. 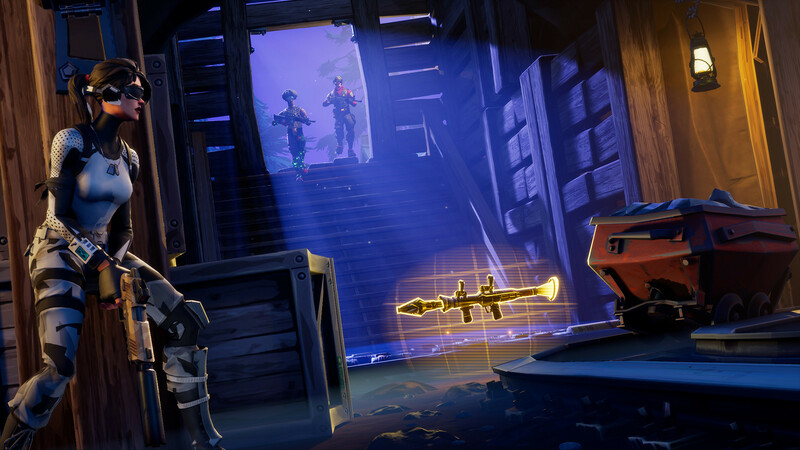 To help you get up and running in solo matches, we’ve put together a few simple tips which cover the full spectrum of what you’ll get up to in an average game of Fortnite: BR, and hopefully make you a little better at each one in the process. Editor's UPDATE #2: We've added a few extra tips and tricks into the section below. We'll continue to update this guide over time, so stay tuned for further strategy advice! When you're done here, make sure you check out our enormous Fortnite: Battle Royale guide - it covers every last area of the game! Pay attention to a few of these points and you'll be sure to bag more solo victories. Choose your landing spot wisely as it’ll set the precedent for the rest of the match. Go for a highly populated area and it’ll lead to more fights, but with a greater chance of getting decent loot. Picking a quieter spot will increase your chances of survival early on, but you’ll need to seek out enemies and plan your looting route carefully if you want to thrive in the late game. You can find some great options in our guide to choosing the best place to land. Every time you find a loot chest, make sure you try and memorise the location of it for next time. You want to be able to pin down your gear as quickly as possible in every match. Don't neglect ammo boxes! It's vital that you always have a steady supply of ammunition. Make sure you’re always harvesting materials. Whenever you’re travelling between destinations, or if you’ve got a little down-time on your hands, make sure you’re chopping trees or clanking cars. Never underestimate the importance of building resources. Trees, pallets, boulders and cars are decent sources of wood, brick and metal. Try and be patient when you’re facing enemies. We know it’s difficult not to panic when you spot someone, but it’s important that you keep a level head and figure out what you can do to put yourself in the best possible position and win the duel. Getting the high ground is easily one of the best things you can do in this game. If anything, you’ll want to establish this advantage over your opponents in every fight. If you've run out of ammo with your primary weapon when shooting an enemy, try swapping to a secondary weapon to finish them off. Otherwise, find some cover before reloading as you'll be vulnerable for a small period of time - just enough for the enemy to claim the advantage. We highly recommend deciding how you're going to play around the impending Storm. If you're new to the game, you should either chase the circle as it closes in and constantly play around the edge. Otherwise, you can choose to take the initiative and find a good position before the Storm Cloud begins closing in, as this'll force people to face you in a disadvantageous position. Constantly listen out for the sound of footsteps when you're looting a building or out in the open. It can be difficult to completely pinpoint where the enemy is, but at the very least you should be better prepared to get on the offensive. If you’ve got the drop on an enemy with a few choice shots to the body, make sure you don’t play too cautiously in fear of suddenly losing the fight. This will give your opponent time to recover and reset the fight. Instead, push your advantage! Close in and secure the kill. Victory favours the bold once a fight is under way. Before drinking shield potions, we recommend finding some cover - or at least building a little box around yourself - for added protection. Don’t be afraid to practice building when you’re engaging in fights or find yourself faced with a large hill to climb. It’s all about building muscle memory, so the more you do it, the more it’ll become second nature. It’s worth occasionally checking the surrounding area by doing a few quick jump-turns in the air. You never know who could be sneaking up on you. If you’ve managed to reach the final circle, we highly recommend setting up a tall tower fort. This will give you much needed protection and the ability to spot the remaining enemies in the vicinity. Our fort building guide has loads of tips for how you can construct your shelter. Your basic item setup should be: 1 Assault Rifle, 1 Shotgun, 1 Explosive weapon, 1 slot for shields, 1 slot for meds. Of course this can be mixed up, but using this is a basic guideline will give your inventory some much needed structure for easier management. It's important you're not shying away too much from fights. Find a balance between taking chances or jumping on opportunities to bag kills, and knowing when to be patient. If you don't fight at all, you simply won't be looted enough to secure the Victory Royale. That's all we have for now, but we'll continuously update this guide with more tips and tricks as we spend more time with the game. Stay tuned!